Rediciously great app. Weather you're a beginner, or a seasoned veteran, this is your guide to the dark & mysterious lost continent of craft/micro brewing!!! This app helps brewers that don't have zillion dollars budgets, to be recognized for their hard work & passion!!! There's more to life than the big three $0.99 is a giveaway!!!!!!! Very cool app. So many places that I wasn't even aware of! I like the map and the details associated with each brewery. Easy to use so far. Has most breweries in assigned areas. Every trip we take, I use BreweryMap to find new breweries/brewpubs. We use the app every time we travel. If you email them about updates, they update right away. If you're a brewery hunter and take road trips often, then this is for you! Love it's simplicity and functionality. Nice work! For any beer lover this app is amazing. Especially for people planing on taking a long road trip. Great app for craft beer lovers! Where I live in Colorado, there are hundreds of breweries and I wanted an app to keep track of where they are and what they offer. I have been looking for an app like this. This app is very well done and provides a clean, simple interface for finding local breweries. Well done! Suggestions: - Allow reviews of breweries and beers. - Be able to create a favorites list of breweries and beers. - Be able to search for beers based on location and the style you like. - Invite friends to meet at a local brewery on a set date and time. - Connect with social media. As actor cycle rider and explorer. I'll regularly use the app to find a brewery and plan a trip. It's the journey that counts not the destination, but the app always makes the destination a pleasure. The map locations are sometimes off by a little, bit I usually Google the brewery to get more accurate turn by turn directions anyway. Bar none the most useful and thought-out beer application on the market. Beyond worth the $.99. The road trip planner is fantastic and will even show the breweries in planning between designated points. Simply a must have for any craft beer drinker/seeker. As mentioned, I read about this app and was one of the reasons I switched to the iPhone. Lived beyond up to its expectations. I have discovered many great breweries traveling the us with this app. Highly recommended. For the beer tourist whose first question when arrived in a new city is 'what's the local beer scene like? ', this is the app for you. The brewery road trip feature is pretty cool as well if you, as I do, often tweak the car trip itinerary based on the breweries on the way. All in all, a great resource that nothing else really matches. Been to nearly 400 breweries - this is a great tool to make sure I know what's in an area. Important to check websites and make sure they are in business yet, allow visitors, and see hours. Well worth the $. I often cross reference with beeradvocate rating. Must have for beer lovers! I am an avid RVer and this app has made my quest for good craft brew simple. I love the road trip option and near me now. If you like beer, you will love this app! So awesome to have an app to help you find great craft beer wherever you are! 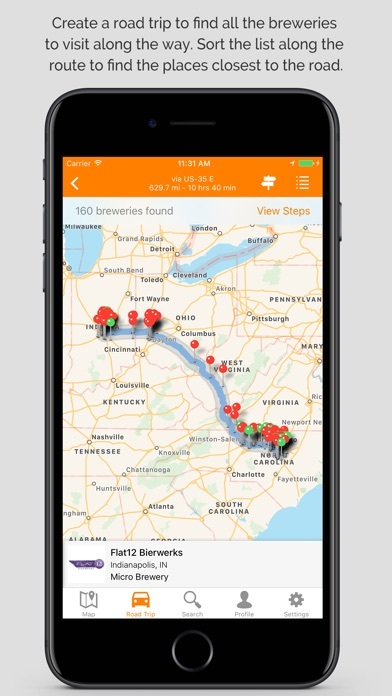 This app will be a huge help finding unknown breweries both at home and on the road. Thanks, guys! This app works great! It found several new breweries in my area! I can't wait to try it out on vacation. This app is fantastic for finding breweries in your area, and the brewery road trip mapping feature is awesome. I just recently downloaded this one and I like it a lot. Cool app. Love the beer list feature with detailed info about the beers. Noticed that a few breweries in Colorado were missing. Would be cool if you could review the breweries and beers on the app. I travel quite a bit and I enjoy craft beer, this app has helped me link the two with ease. Simple interface and lots of info make this a great app for finding breweries. Maps are spot on, and website links are included. This is a winner. This app has a comprehensive list of breweries by region and I really like the Road Trip feature. It is fairly accurate on the brews each brewery offers. It would be a great app if it would allow you to search by specific beer styles for the region you are in. Recently I was in San Diego and wanted to find breweries with sour beers. When using the search function I could find beers and breweries with "sour" in the name but not breweries who offer sour beers. Further, search results were not local to the region. Overall I like the app and will continue to use it but it could be more functional. You should too Read that someone called it unstable Maybe on his iPhone 3 Works great and frequently updated. Awesome app to discover/visit breweries that just opened, that you never realized where there or while traveling. A must have! I'm not sure why, but the app can't find Dogfish Head and I'm just ten miles away. Nothing seems to work on this app anymore. Excellent concept, poor maintenance. 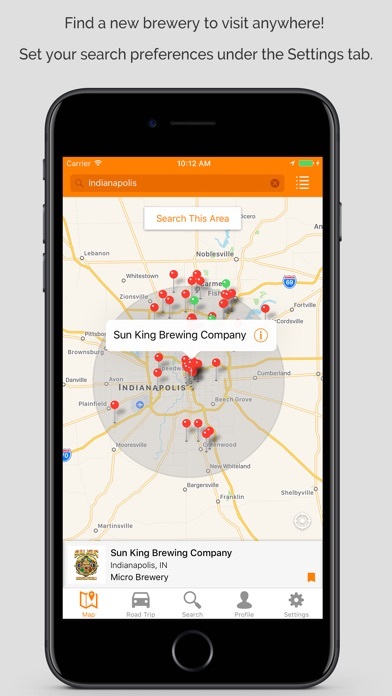 If you're looking for an app to help find craft beer and breweries, this is it! Only things needed to finish it off as the best is all listed breweries/brewpubs information should be listed. Most are missing information, like hours of operation, their web address, and most importantly, the beers they serve. Also, the app needs a favorites or save listing, so users can save places they love or wish to visit later on down the road, whether they're local or out of state. Worthless app doesn't really do anything crashes all the time. Save your $4 and buy a beer you will be happier!! After enjoying this app for two years or more, I am disappointed to say that the app no longer works. When I search a location the icon just spins and spins. I am planning a trip in a few weeks and was looking forward to using this app to find some breweries along the way. Hopefully I will be fixed by then. Definitely worth the money. Great app! Good functionality but Needs updated with more places. Very useful for finding new breweries when traveling. Should only improve as more breweries and information for them are added. Great to see the ciders category as well. This app is quite useful when traveling. I use it to determine where I'm staying. I have discovered so many breweries (both in my city and on road trips) using this app. Highly recommend it! The app does what it says, and looks good doing it. Keep up the good work guys. We always use this app when traveling to map out a brewery or two to stop at. It would be nice if you could mark which ones you've been to or whether you liked them, but overall this app has a lot of good info and is awesome for finding som hidden gem breweries. I travel for work and live by this app for my after hours brewery visits in other cities. If you type in a search it does provide good results but you have to type in your current location if you want results. There should be a default to be able to select current location like map apps. Currently while in MA if I search current location I get breweries in MO. I think it would be nice to be to tag/rate brews that you've sampled. It's great, and wish it would have distilleries. But definitely the best. Use it all the time when traveling to find nearby breweries. In previous versions you could search by distance easily and effectively. 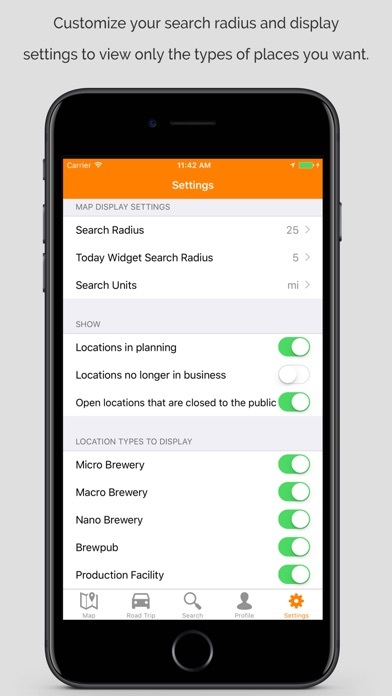 In this version you set the search distance in the "Settings" app however making any changes there does not affect the results inside the BreweryMap app, it appears searches are hard limited to 15 miles now. Very unfortunate, two stars down from five. Update: they have now removed the distance search feature from the app and from the settings. This has really limited the usefulness of this app. A 50 mile search was about right, 15 miles is a joke. I absolutely love this app. I'm on a mission to hit every brewery in Colorado and I could not do it without this app. Great app and it promises to only get better because someone's really listening. Keep up the good work! Love the app but would really like it if it allowed the user to tag each brewery once it's been visited and have the pin color change for those. I've been using it for years and it's awesome for road trips. A must have for any craft beer geek. Brewery Map is a very resourceful guide for those who are very interested in beer and discovering breweries around the country. 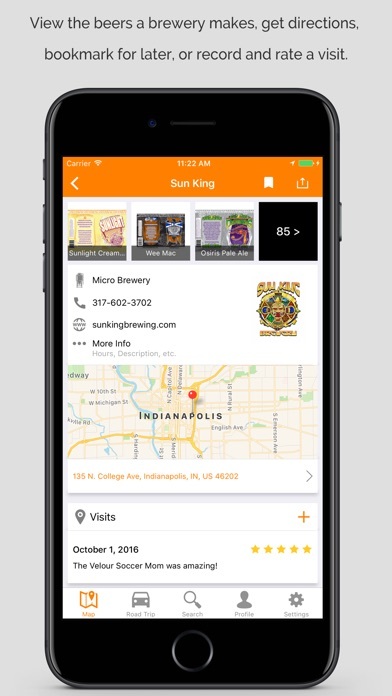 The app is easy to use allowing users to easily enter their location to see what breweries are nearby or available. Breweries users are interested in visiting or keeping in mind can be added to a personal wishlist. The app can also be used to search for beers of all types whether commercial, brew or whatever one can think of to see where they are some as well as get more information about them. The app is heavily on the crowdsourcing side so besides just personal ratings users can contribute breweries that may not be listed. The search methods vary as one can use name, location or even scan the UPC code on a bottle. 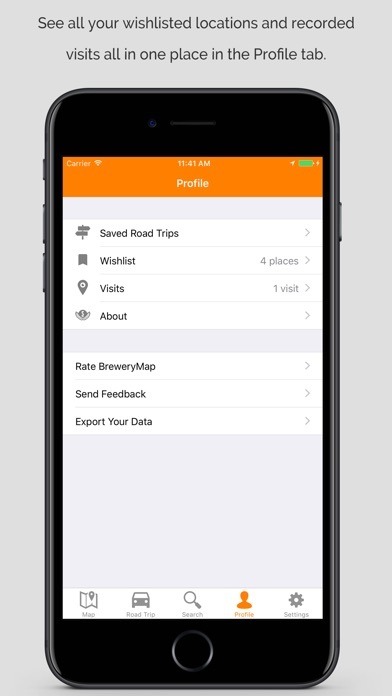 The app has something extra for those who like to travel to breweries with the inclusion of a road trip feature. This is an app definitely for those in the beer tasting or crafting culture or maybe those who just like to get drunk. Love it. Makes it easy to find new brews and make road trips. This App is awesome and I love using it for local and not-so-local brewery adventures. However, it is not up-to-date with the rapid expansion of new breweries where I tend to be, especially locally in Milwaukee. Up to date lists, ability to create a road trip of several breweries. Great app for road trips and brewery tours!!! My boyfriend and I use this app every trip we go on to check out the breweries on our way. Just wish it were updated more regularly. Apps like this, I never expect much... However in this case; as a frequent traveler, this has been a gift from the beer gods! I plan my road trips using the road-trip feature, and make stops for lunch & dinner at new and unique places all the time. The specific details are sometime slightly off, or lack updating. However, anyone using a smart phone should be able to find accurate information quickly. Great stuff! Use it all the time. Wish it came with a schedule of food trucks as well! What an upgrade! Looks great, and is easy to use. A must have for road trips. The today widget is great as well. The only thing is I wish I could add Brewery Logos when they are missing. But no biggie. Must have app for craft beer lovers! Awesome app!! Love the road trip feature which we just used from Indiana to Virginia. Too many breweries, so little time. Don't leave home without it!